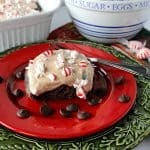 Chocolate Malted Peppermint Sweet Rolls with Chocolate Malt Icing may take a bit of time and effort to make, but they’re totally worth every minute. If you’ve been following along, then you know that the past several recipes I’ve posted have been in celebration of #Choctoberfest 2016. Since this will be my last post for this event (don’t worry, I’ll still be posting chocolate recipes from time to time), I’ve decided to go out with a bang! 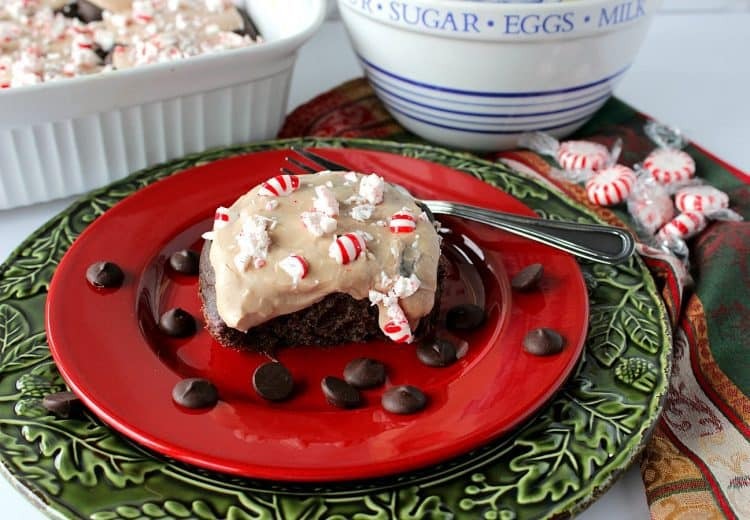 Today I’m bringing you my recipe for Chocolate Malted Peppermint Sweet Rolls with Chocolate Malt Icing. And, yes. They’re everything you’d hope they’d be! This post has been sponsored (with product) by Imperial Sugar. I’ve never before received such a sweet visitor at my door. Thank you. Welcome back to my fourth and final recipe post celebrating #Chocotoberfest 2016. #Choctoberfest is an awesome annual food blogger event where your favorite food bloggers (70 to be exact), come together to celebrate all things chocolate, share our best recipes, and even throw in a sweet giveaway! 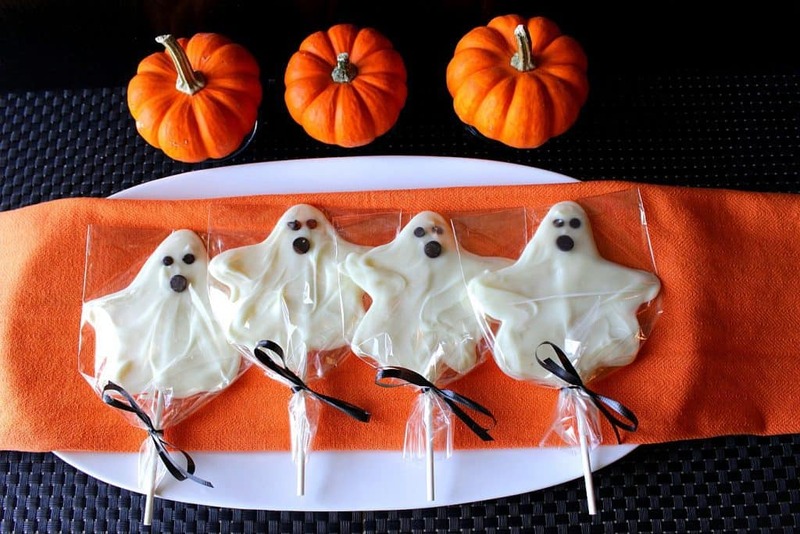 To learn more about the GIVEAWAY, and for your chance to ENTER to WIN the FABULOUS PRIZE PACKAGE (made possible by our generous sponsors), please visit my previous #Choctoberfest recipe post found HERE for my Deliciously Easy White Chocolate Ghost Pops. While you’re at it, why not follow Allison from The PinterTest Kitchen on pinterest? Without her, none of this #choctoberfest deliciousness would be happening. Thanks so much, Allison!! If, by chance, you’ve missed my previous three recipes for #Choctoberfest, let me take a quick moment to catch you up. First was the Deliciously Easy White Chocolate Ghost Pops (mentioned above), the second was Double Chocolate Cheesecake with Chocolate Espresso Cracker Crust, third was for my Old Fashioned Chocolate Caramel Turtle Fudge with Pecans. And finally today (with the recipe following shortly), Chocolate Malted Peppermint Sweet Rolls with Chocolate Malt Icing. 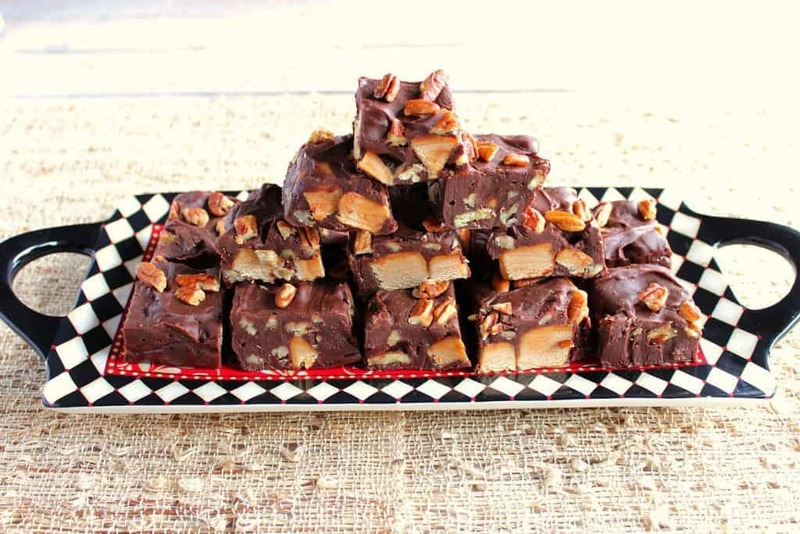 How’s THAT for some delicious chocolate recipes? If you’re interested in subscribing to my Youtube channel, you can do so HERE. 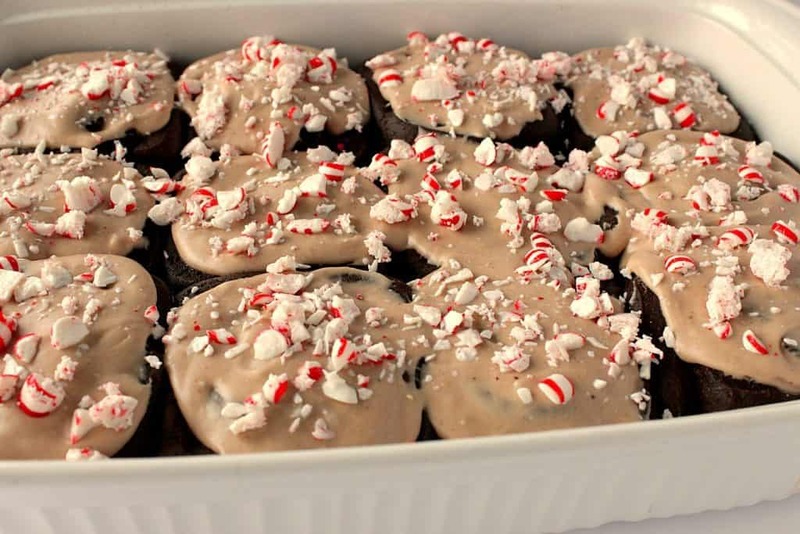 Chocolate Malted Peppermint Sweet Rolls with Chocolate Malt Icing may take a bit of time and effort to make, but they're totally worth every minute. Add the warm milk, melted butter and granulated sugar into the bowl of a stand mixer. Add the yeast to the milk and butter mixture and stir well to combine. Allow the mixture to sit and get foamy (approximately 10 minutes). Stir the flour, salt, egg, cocoa powder, and chocolate malt powder to the bowl and stir slight to combine. Switch to the dough hook for the stand mixer and thoroughly knead the dough until it comes away from the sides of the bowl, and forms a soft ball (at least 7 minutes). Transfer the dough to an bowl that has been sprayed with coconut oil and cover the bowl with plastic wrap. Allow the dough to rise until doubled in bulk in a warm, draft free place (approximately 90 minutes). Spread the softened butter evenly over the entire surface of the dough. 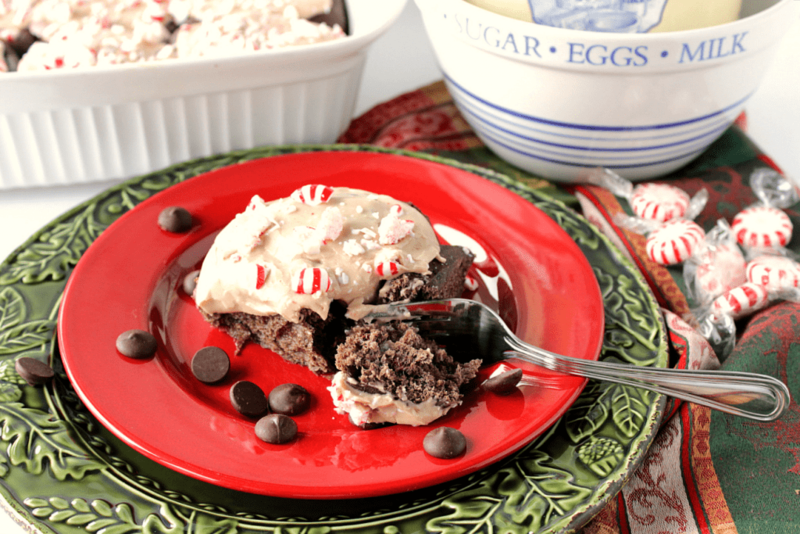 Top the dough with ½ cup of the crushed peppermint, and ½ cup of the chocolate chips. Roll the dough, lengthwise to form a cylinder. Place the rolls into a 9" x 13" baking dish that has been sprayed with coconut oil spray. Place the rolls in a warm, draft free place to rise until doubled in volume (approximately 90 minutes). Once doubled, preheat oven to 375 degrees and bake the rolls for 30-35 minutes. Until a toothpick inserted into the center of the dough comes out clean. While the sweet rolls are cooling, prepare the icing. Add all the icing ingredients into a medium bowl, and whisk until smooth and creamy. 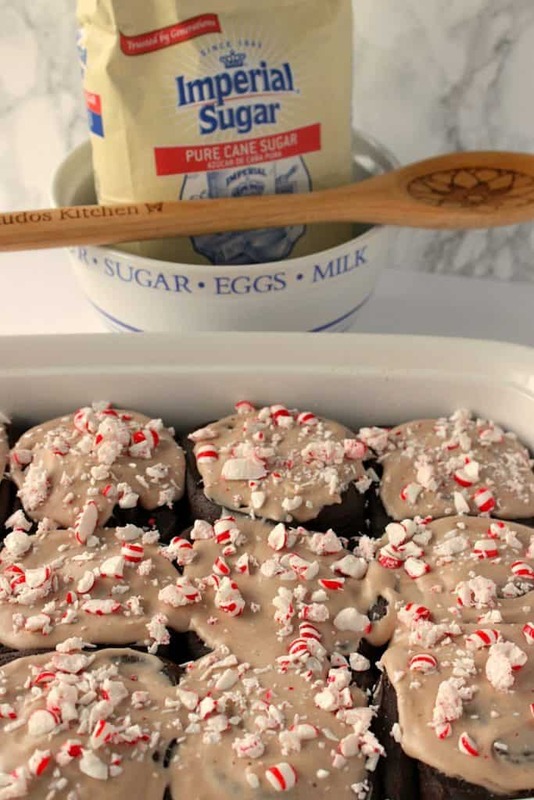 Spread the icing liberally over each sweet roll and sprinkle the top of each roll with the remaining ½ cup of the crushed peppermint candy. And now, back to the #Choctoberfest celebration and all the fabulous food bloggers and their deliciously chocolaty recipes. 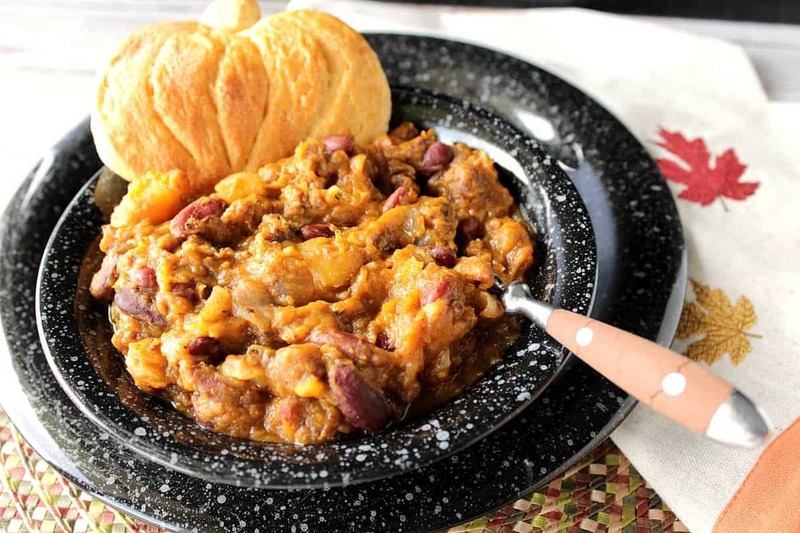 By clicking on the photos below, you’ll be taken directly to their recipes. I sure do hope you’re hungry!! 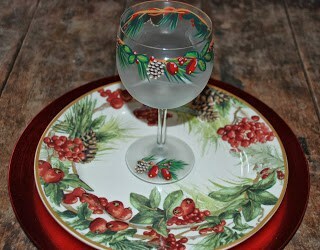 But wait, before you go I’d like a chance to show you these elegant frosted Winter in the Woods wine glasses that I painted two years ago for a customer/friend who wanted them to coordinate with her holiday china collection. After receiving her glasses she was generous enough to share a photo with me of her place setting. Needless to say, I was thrilled to see her finished table setting. If there is ever anything I can paint for you, from glassware items to fabrics, please don’t hesitate to contact me or visit one of my shops: Etsy and Wazala. I always welcome custom orders, and will happily paint and design from any photo (like the glasses show above), idea or description you send my way. I lovingly hand paint each item I ship with great attention to detail. Each glass will come in its own gift box, making them perfect for gift giving. Renee, your artwork is absolutely beautiful. I definitely need to visit your Etsy shop to explore some of your items further as well as ordering an apron for me. These rolls look fantastic. 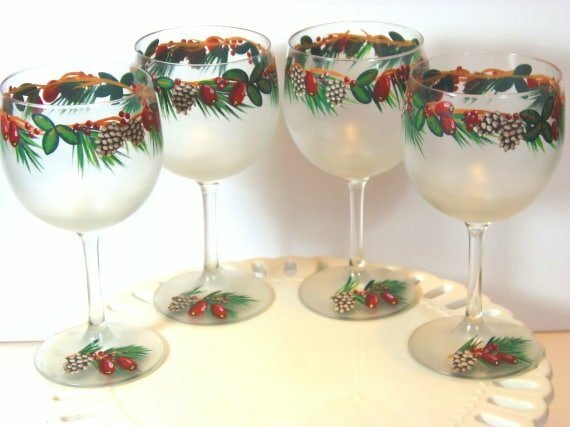 We’ll have family members staying with us between Thanksgiving and Christmas and this would be perfect to serve – so festive! 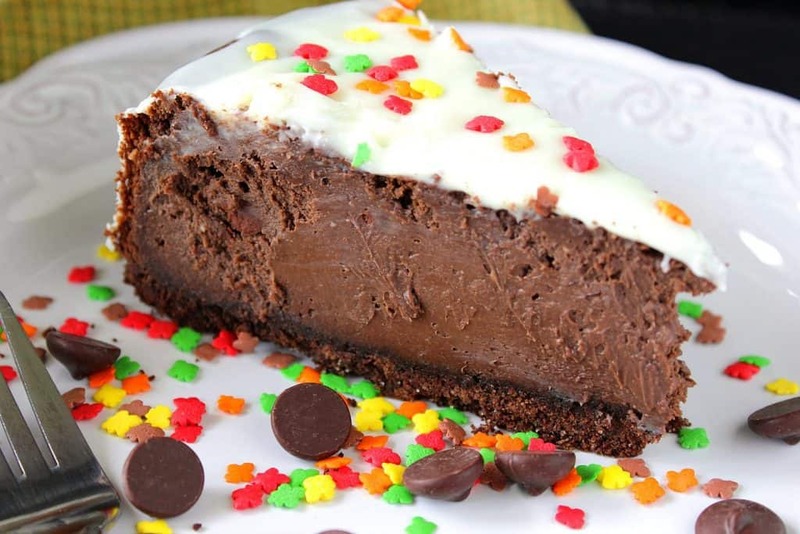 I would definitely make these for breakfast and have the leftovers for dessert! Whoa, those look so thoroughly scrumptious! I love that the base is a yeast dough! WOW!! I really love these! Perfect for the holidays!! Wowza I want these stat!